Hey Epic Mickey 2 you’re so fine, you’re so fine (with your 2 player local co-op) you blow my mind. Hey Mickey, Hey Mickey. Do you know who Warren Spector is? He is a developer who helped bring some great games to fruition; Wing Commander, Deus Ex, Thief and for some strange reason Epic Mickey 2: The Power of Two. On paper you would think that the gritty and dark tales (not Duck Tales) of Deus Ex et al have little in common with a cartoon mouse and his Technicolor antics, but you would be wrong. This is a Disney filtered through the mind of Spector in an age that has already seen Kingdom Hearts. Welcome to Wasteland, a steampunk version of the Disney dream, turned nightmare, and this time bring a friend. Epic Mickey 2 is a most classic of platform archetypes, many of the gameplay mechanics and level design elements would not have been out of place in the early days of the PlayStation 2, but is that a bad thing? Whilst once the console market was saturated with colorful platformers, now they are as rare as a summer blockbuster not produced by Disney. You play as Mickey and Oswald, after the events of the first game (something to do with a Mad Scientist and his metallic monsters); Oswald needs Mickey’s help once more and drags the mouse-that-can back into the world of Wasteland. Together you must uncover who is behind the sabotage going on throughout the land. On a basic level, Epic Mickey 2 is a 3D platformer. You can play it solo, but the game has been designed with 2 player local co-op in mind. This is because (apart from the prologue) both Mickey and Oswald are together throughout. 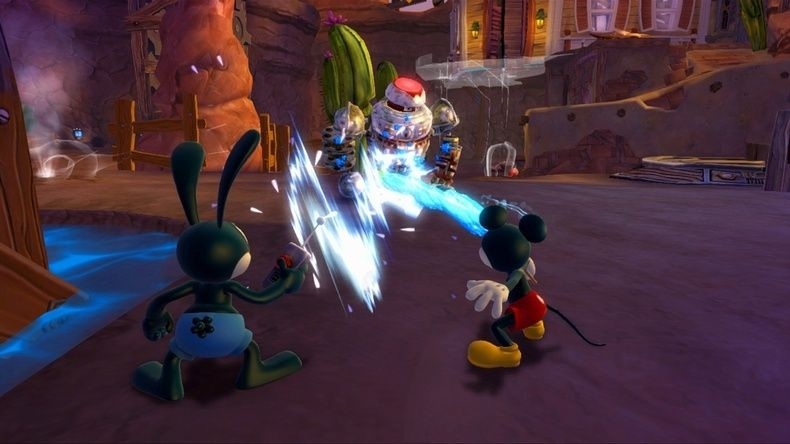 Whilst many two player co-op games will have player 1 and 2 essentially controlling the same character, but in a different skin, Epic Mickey 2 makes you work together as your skills compliment one another. Player 1 is Mickey – he has the ability to use a magic brush that reveals hidden areas, create platforms of fix elements of the level. Oswald’s powers are very different; he has the ability to use electricity and jump high. To solve the game you must combine the two skill sets; perhaps Mickey will reveal an electronic socket that Oswald will need to zap, or there may be a ledge that Mickey needs to get to, but requires Oswald’s help. 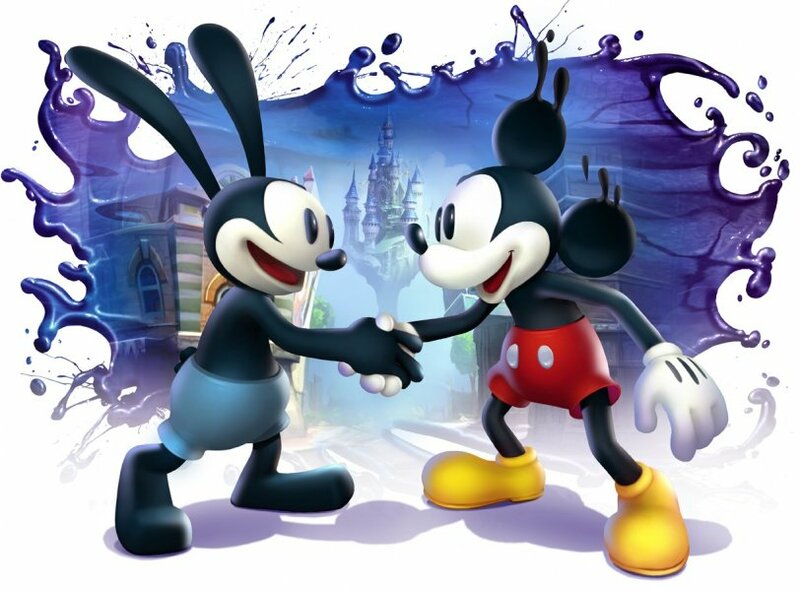 True co-operation in a game is rarer than you think and with levels designed around just this, Epic Mickey 2 encourages communication between local players. The co-op elements of Epic Mickey 2 are probably the best things about the game, elsewhere things are a little shakier. There is an old school feel to the game that will please some people, but turn others right off. Within Wasteland there are lots of characters all wanting different things. This means that the game is crammed to the gills with collectables; great for increasing the life of a game for collect-oholics, but meaningless for most people. With so many side missions being triggered all the time, I was often unsure of where I was actually meant to be going. I basically headed off in what I believed was the right direction. There are also issues that crop up in the majority of 3D platform games – camera angles for one. With the screen split down the middle for the co-op, this is doubled. You will find it hard to make that leap when both of you are running around a level trying to avoid Pete’s mental dragon. I also found some glitches in the level design and one or two puzzles that took a little too long to solve for what is essentially a title aimed at a younger market. Despite its inherent flaws, Epic Mickey 2 is a fun game that will last a long time. The world of Wasteland is a little scary, but very interesting. It mixes the tone of Bioshock with a ribbon of Disney’s own brand of magic. The game uses tones of dark and light throughout, encouraging children to overcome their fears and realize that doing good can help people. Perhaps the biggest praise should be left for the co-op. This is a game made with local 2 player co-operation in mind. You may find some of the camera angles a little grueling, but at least you know you will have to truly work together if you wish to progress. The House of Mouse did alright with this one. Editor's Note: The Co-Optimus Co-Op Review of Epic Mickey 2: The Power of Two was based on the Xbox 360 version of the game. The Co-Op Experience: Join Mickey and Oswald in an epic battle to save the magical world of Wasteland and change it forever. Page created in 0.4418 seconds.